Luke 6:29-30. To him to strikes you on the one cheek, offer the other also. And from him who takes away your cloak, do not withhold your tunic either. Give to everyone who asks of you. And from him to takes away your goods do not ask them back. Recently my parents moved from one house to another. When my parents moved they put their first house in up for sale. It was on the market for a several months when my mother received a call from another Christian who attended a certain church in town. He informed my mother that he had been praying, and God had revealed to him that my parents were supposed to give their house to him. What did my mother do? Rather than turn him down outright, she said that she would pray, and talk with my dad, and see if God told them the same thing. That is what they did. They prayed. They talked about it. After doing this for several days, wouldn’t you know it, God told them…nothing. So they called the man, and told him, “Sorry, we are not going to give you our house.” He, of course, got upset and told them that they were disobeying God and God would judge them and destroy the house and all their possessions because of their greed. We come to a passage today that says we should give to the one who asks us, and if they ask for our cloak, give them our tunic as well. Were my parents wrong after all? “YES!” That person in Missoula says, “They were wrong. 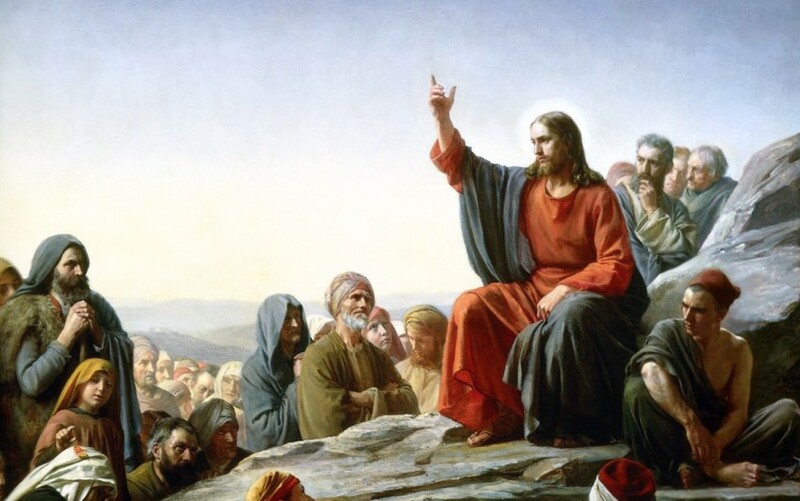 Jesus says to give to anyone who asks you and not ask for it back.” But if my parents had given him the house, what is stopping him from asking further for their house in Bigfork, and their car, and access to their bank account? What’s stopping him from coming and taking all of your possessions and my possessions? Maybe we should beat this guy to the punch and ask him for all of his possessions before he asks for ours, that way, he can’t ask for them back. But then, once I have all of his possessions, what’s stopping one of you, or someone else to come and ask for all of my possessions? In fact, Jim Carrey did a movie a while back on this very premise. In the movie “Yes Man” he is attends a self-help seminar where the people are challenged to say “Yes” to everything. The movie is based on what happens to him as he commits to doing this for an entire year. While some good things do happen to Carrey’s character, some bad things happen too. Ultimately, Carrey realizes that you simply cannot live your life just giving to everyone who asks something of you. So was Jesus wrong when He told us to give to everyone who asks of us? Jesus’ statements cannot consistently, literally, legalistically, universally be carried out. Chaos would result. But Jesus has to be saying something. He is not just spouting gibberish and nonsense. He is not just saying shocking statements for shock value. I want to sort through all of this for you, and we will do that by looking at the text and by letting the rest of the Bible weigh in on this subject. The attitude Christ wants us to develop is found in Luke 6:27. He wants us to love our enemies. He then gives three exhortations on how to love our enemies. We have looked at these previously. Jesus now turns to provide us with three examples for how to love our enemies. Striking a person on the cheek does not refer as much to physical injury, as to insults and indignity. In Jewish culture, the greatest insult, the most demeaning and contemptuous action possible, was a slap on the cheek. It was an ultimate and deliberate gesture of disrespect. There is some indication that this was the way Jewish synagogue leaders put people out of synagogue – especially Jews who had converted to Christianity. A contemporary parallel would be if someone spit in your face, though even that is not quite equivalent. The slaves in Jesus’ day would rather have someone strike them on the back then slap them in the face and insult them in such an embarrassing and undignified way. So the slap on the cheek refers to receiving a deep insult. 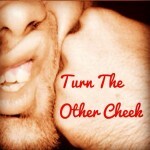 Turning the other cheek means that when you are severely insulted, don’t trade insults. When you are slandered, keep silent, and let them insult you again. What normally happens when someone insults you? You insult them right back. Generally, the insult you retaliate with is greater than the insult they served to you. Then they try to respond with an even greater insult. Have you seen the television commercial where the two men are standing over a grill trading insults about colleges they had attended and girlfriends they had dated? Finally, the man grilling the steaks picks one of them up and throws it on the ground saying, “Your steak” and then points to all the rest of the steaks on the grill and says, “My steaks.” That’s trading insults until it gets to the point where the man’s meal is ruined. When you get into an insult war, a lot more can be ruined than just a meal. Lives can be destroyed. Homes wrecked. Jobs can be lost. Jesus says that it is better to take an insult quietly than to say or do something that might eventually destroy a person. He is saying that when you are at odds with someone else, and they insult you, refuse to retaliate. Be the peacemaker. You can either trade blow for blow, with each insult and injury getting worse and worse, or you can be the one to break the cycle of retaliation and stop the downward spiral into hate and hurt. This is practical stuff. If you are married, and you’ve been married for any length of time, you have probably had some pretty serious arguments with your spouse. Sometimes, as the argument progresses, you aren’t really arguing any more, you’re just trading insults. Then it becomes more about winning the fight than solving the disagreement or saving the relationship. You want to hurt them as much as they hurt you. When this happens, you have a choice. You can either keep the retaliation cycle going and continue to lash out at your spouse with a verbal backhand, or you can break the cycle and choose to be the one to take a blow. Someone has to stop caring about winning the fight and focus on saving the relationship. Someone has to absorb the blow. You say, “I don’t want to appear weak,” but I’ll tell you that it is only the strongest person who can take an insult and let it go. It’s the weak who retaliate because they can’t take it. Only the strong roll with the punches. Has it ever occurred to you how many slaps in the face God takes every single day? There are countless millions of people around the world shaking their fist at God, cursing God, rebelling against God every single day. Even us, His own children, when we sin, slap God in the face. And yet we’re not incinerated. We’re not squashed like a bug. Lightning doesn’t come out of the sky and fry us. Why not? It’s not because God is weak, but because He is so strong. He can take it. He doesn’t feel the need to retaliate at our petty insults. He just keeps on loving us. Apply this to your own life. What is more important? Getting your retort in, or getting your wife back? What shows more strength? Making your witty but cutting remark, or rebuilding a relationship? Be someone who is willing to take the blows. Someone who refuses to retaliate. Someone who serves rather than slaps. The backhand was not a blow to injure, but to insult, humiliate, degrade. It was not administered to an equal, but to an inferior. Masters backhanded slaves; husbands, wives; parents, children; Romans, Jews. The whole point of the blow was to force someone who was out of line back into place. Notice Jesus’ audience: “If anyone strikes you.” These are people used to being thus degraded. He is saying to them, “Re-fuse to accept this kind of treatment anymore. If they backhand you, turn the other cheek.” (Now you really need to physically enact this to see the problem.) By turning the cheek, the servant makes it impossible for the master to use the backhand again: his nose is in the way. And anyway, it’s like telling a joke twice; if it didn’t work the first time, it simply won’t work. The left cheek now offers a perfect target for a blow with the right fist; but only equals fought with fists, as we know from Jewish sources, and the last thing the master wishes to do is to establish this underling’s equality. This act of defiance renders the master incapable of asserting his dominance in this relationship. He can have the slave beaten, but he can no longer cow him. Such defiance is no way to avoid trouble. Meek acquiescence is what the master wants. Such “cheeky” behavior may call down a flogging, or worse. But the point has been made. The Powers That Be have lost their power to make people submit. And when large numbers begin behaving thus (and Jesus was addressing a crowd), you have a social revolution on your hands. If you find yourself in an insult contest, the only way to win is to be the one to lose. This is the first example. When someone insults you, let them insult you again if it will bring peace. The second example from Jesus is just as challenging and thought provoking. Still in Luke 6:29, He says, And from him who takes away your cloak, do not withhold your tunic either. He is teaching a principle almost exactly similar to the slap on the cheek. He is not saying that we should stand on the street corner and let someone rob us. When it comes to disagreements and arguments, someone is going to have to absorb a blow. Sure, you can go through the law courts, and sit through a trial, and allow some judge to decide which one of you will absorb the blow. But why don’t you save yourself all the time and headaches, and just absorb the blow yourself? If there really is a disagreement, and it’s hard to determine who is wrong and who is right, and what sort of restitution is necessary – be the bigger person, be the peacemaker and give them what they want. Give them more than what they want. I am, of course, referring to all the lawsuits and issues going on right now between the Christians who have a religious belief that gay marriage is a sin and the homosexual community who believes they are being given equal rights under the law. I hasten to add, of course, that I don’t believe that LGBTQ people are my enemies, but many Christians do seem to have this feeling. But whether or not YOU feel that LGBTQ people are your enemy, the words of Jesus apply to whomever you think IS your enemy. Jesus is not advising people to add to their disadvantage by renouncing justice altogether, as so many commentators have suggested. He is telling impoverished debtors, who have nothing left but the clothes on their backs, to use the system against itself. Indebtedness was a plague in first-century Palestine. Jesus’ parables are full of debtors struggling to salvage their lives. Heavy debt was not, however, a natural calamity that had overtaken the incompetent. It was the direct consequence of Roman imperial policy. Emperors taxed the wealthy heavily to fund their wars. The rich naturally sought non-liquid investments to hide their wealth. Land was best, but it was ancestrally owned and passed down over generations, and no peasant would voluntarily relinquish it. However, exorbitant interest (25 to 250 percent) could be used to drive landowners ever deeper into debt. And debt, coupled with the high taxation required by Herod Antipas to pay Rome tribute, created the economic leverage to pry Galilean peasants loose from their land. By the time of Jesus we see this process already far advanced: large estates owned by absentee landlords, managed by stewards, and worked by tenant farmers, day laborers, and slaves. It is no accident that the first act of the Jewish revolutionaries in 66 c.e. was to burn the temple treasury, where the record of debts was kept. It is to this situation that Jesus speaks. His hearers are the poor (“if any one would sue you”). They share a rankling hatred for a system that subjects them to humiliation by stripping them of their lands, their goods, and finally even their outer garments. Why, then, does Jesus counsel them to give over their undergarments as well? This would mean stripping off all their clothing and marching out of court stark naked! Nakedness was taboo in Judaism, and shame fell less on the naked party than on the person viewing or causing the nakedness (Gen. 9:20-27). By stripping, the debtor has brought shame on the creditor. Imagine the guffaws this saying must have evoked. There stands the creditor, covered with shame, the poor debtor’s outer garment in the one hand, his undergarment in the other. The tables have suddenly been turned on the creditor. The debtor had no hope of winning the case; the law was entirely in the creditor’s favor. Imagine the debtor leaving court naked. His friends and neighbors, aghast, inquire what happened. He explains. They join his growing procession, which now resembles a victory parade. This is guerrilla theater! The entire system by which debtors are oppressed has been publicly unmasked. The creditor is revealed to be not a legitimate moneylender but a party to the reduction of an entire social class to landlessness and destitution. This unmasking is not simply punitive, since it offers the creditor a chance to see, perhaps for the first time in his life, what his practices cause, and to repent. So Jesus is not teaching that we should allow ourselves to be taken advantage of. He is not telling us to be doormats, or to allow people to steal our houses and cars and bank accounts. Let me give you an extreme example. Should a Christian father passively watch as a thief plunders his house, and carries away his children? Does God require us to stand by idly, saying, “God bless you, brother. Here is a blank check for you to empty my bank account. And by the way, please read this gospel tract”? Never! God wants us to do everything within our power to restrain evil. But it is not our responsibility to retaliate. How difficult this is when we live in a day when it seems that the only people who have any rights are people who do wrong. The ones who try to live right are the ones who get bruised and beaten in the process. The criminals and those who are irresponsible or are trying to cheat the system are the ones who seem to have everything going for them. If you work hard, if you are responsible with your money, if you are honest at work, it seems that you are the one who gets the short end of the stick. When you find yourself in such a situation, Jesus says there is a way for believers to deal with injustice in our lives, and that is not to get caught up in the trading of hostilities and lawsuits that the rest of the world operates by. There are ways to work though our differences rather than resorting to litigation and lawyers, where the only true winners are the lawyers. Of course, having said all of this, it may be that sometimes, it is to your benefit spiritually to help the thief and give him what he wants and more. If you have read the book Les Miserables, or watched the movie, you remember that near the beginning of the story, Jean Valjean steals the silverware from a church bishop. When Jean Valjean is arrested by the police, the Bishop makes it appear that he gave the silverware to Jean, and gives him two silver candlesticks as well. 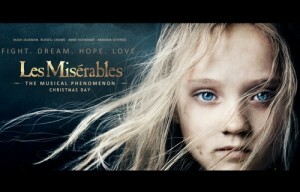 It is this act of kindness that causes Jean Valjean to turn from a life of stealing to a life of helping other people. So there are instances when helping someone out when they try to steal from you may be exactly what they need to become a better person. Life had been hard on them, and they may need a little help from you. Recently I read in the news about a man who led the police on a high-speed chase after shoplifting a local department store. Apparently, a man shoplifted several items, then led store employees and police on a high-speed chase through town before he was arrested. I don’t know the whole story of this man, what his situation was or why he stole the things he did, but one of the things the newspaper reported he stole was a child’s snowsuit. It makes me wonder. Does this man have a child who needs a snowsuit for the winter? Had he all of a sudden become so desperate to provide for his family that he had to resort to stealing? I don’t know. The article also said he had drug paraphernalia and a suspended license, which tells us he had several other problems as well. All I’m saying is that if there is someone in your life or my life who genuinely has a need, Jesus says it is our responsibility to meet that need. Don’t let people rob you, but if they try to take things from you out of desperation, you might want to let them have what they want, and give them a little extra. The issue is not property rights, but the enemy’s eternal life. Do not chase the thief to kill him. Chase him to save him. Now, I cannot lay down hard and fast rules on how this works. I have no guidelines on how to know if a person has a genuine need or not. It’s a situation by situation decision that you and God will have to work through together. Maybe what Christ says next will help us understand this a little bit more. The first example was to turn the other cheek. The second example was to give your tunic. The third and final example is to not seek repayment. This third example is found in Luke 6:30. Give to everyone who asks of you. And from him who takes away your goods do not ask them back. There is a lot of historical background to this statement that we must understand as well. Much of it has to do with God’s credit system. 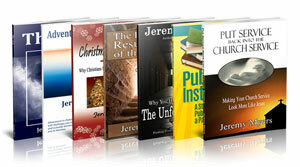 Did you know that God set up the ideal system of borrowing and lending? Our system in America doesn’t work. It lets people borrow and max out their credit cards until people must either declare bankruptcy or live forever under the weight of interest payments and out of control debt. But God had a better plan. In the Old Testament law, God instructs his people that it is okay to take out and give loans, but with certain conditions as laid out in Leviticus 25 and Deuteronomy 15. The basic principle is that no one should be in debt or in need for very long. Deuteronomy 15 really brings this out. There we read that every seven years, all debts are cancelled. So understand what would happen. Imagine that you are a rich land owner, and the seventh year of canceling debts was next year. But a poor man comes to you and says that his crops failed, his wife got sick and he cannot feed his children. Can he borrow money from you. He will pay it back, he promises. You are skeptical. And besides, the seventh year of canceling debts is almost here. If he does not pay it back by next year, you will have to forgive him his debt. You would have to take the loss. But Deuteronomy 15 goes on to say that in such situations, you should give generously to the one in need, even if he never pays you back (Deuteronomy 15:7-11). The follower of Christ is a person who gives generously and freely to those who have genuine needs. What Jesus is not calling you to do is give indiscriminately to all. Some people think this way, because Jesus says, “Give to everyone who asks you.” But let’s be sensible. If you literally had to give to everyone who asks you, you would have to give to pro-abortion lobbyists, and people on the street who are just going to spend the money on drugs or alcohol. William Law, an excellent pastor and the author a little book called A Serious Call to a Devout and Holy Life was set on following all of Christ’s commands literally. He and two rich friends agreed to live together and spend as little as possible on themselves while giving away as much as possible. They gave money to everyone who asked them and did not turn away anyone. The results was that they attracted quite a crowd of idle and lying beggar. Some of them were criminals and thieves. Others just lazy and not willing to get a job even though they could have gotten one. For a long time William and his two companions tried to shut their eyes to the evil which he and his friends were supporting and paying for. But finally, the law makers, policemen and neighborhood citizens came and told William and his two friends to be more selective on who they gave their money to. You see how Christ’s third example can be misapplied. God does not truly want us to give to everyone and anyone who asks us. He wants us to use our money and possessions to accomplish the most good. God has given us the finances and material wealth we have in order to support those causes that will further His kingdom. Give to those people who are genuinely in need. If our giving makes allowance for another person to sin, God is not pleased with our giving. Be creative in what you give and how you give it. When Wendy and I were living in Chicago, there were numerous homeless people on the streets asking for money. We never gave them any money, because we didn’t know what they were going to spend it on. But we frequently went and bought them a meal and were then able to share the Gospel with them as well. In this way, we were able to give to those who asked of us, and not seek repayment, and give them more than what they want, and all of it accomplished good, not evil. Do people request to borrow from you? Let them, and don’t seek repayment. These are some hard teachings, but as followers of Jesus Christ, our behavior and conduct in this world must be radically different. He has given us three examples about loving our enemies. As always, Christ practiced what he preached, though some believe He did not in one instance. When Jesus is placed on trial right after his arrest, Annas the High Priest questioned Jesus, and Jesus responded by saying, “I spoke openly to the world. I always taught in synagogues and in the temple, where the Jews always meet, and in secret I have said nothing. Why do you ask Me? Ask those who have heard Me what I said to them. Indeed, they know what I said” (John 18:20-21). When He had said this, one of the officers standing near Jesus gave him a blow. When this happened, Jesus did not turn the other cheek. Instead, He said, “If I have spoken evil, bear witness of the evil; but if well, why do you strike Me?” What a surprise! When Jesus really had an opportunity to turn the other cheek, He didn’t do it. Or did He? While He didn’t literally turn the cheek of his face to take another blow, he did allow Himself to be arrested. He allowed Himself to go through a terribly unjust trial. He allowed Himself to be beaten, mocked, cursed and spit upon. He allowed Himself to be nailed to that cross and killed. This is the ultimate turning the other cheek. 1 Peter 2:23 says that Jesus, “when He was reviled, did not revile in return; when He suffered, He did not threaten, but committed Himself to Him who judges righteously.” Was this because He was weak? Hardly. Jesus could called down fire from heaven, or a legion of angels to protect him. With a snap of his fingers, He could have obliterated earth. He had the power to retaliate. It takes true strength to restrain yourself when others insult you. It takes true strength to break the cycle of revenge and retaliation. He was the anvil. He was the punching bag. Why? So that He could restore a relationship with us. This is what 1 Peter 2 goes on to say. The reason Christ did not retaliate is so that we, who were his enemies, might live for righteousness. So that we might become his brothers and sisters. Do you have an enemy? Don’t retaliate. Instead, seek ways to be reconciled. This is difficult to do because we are a fight-back generation. We know our lawyers’ phone numbers better than we know Scripture verses on self-restraint. We are quick to get mad. Quick to fight back. Quick to retort and retaliate. Quick to demand our rights. But when was the last time you deliberately took it on the chin, turned the other cheek and kept your mouth shut? Try it. Such behavior may be so shocking, the other person will want to know why you are so different. Then you will have an opportunity to share what Christ has done for you when you were still His enemy. Maybe you will be reconciled to your enemy, and better yet, he may be reconciled to God (2 Cor 5:18-20). Very good. I never thought of it that way. I wish we could tell the government this! Well written wisdom of God. Retweeted. I am no longer a Christian, but I grew up in the church. I have been going through a small monetary dispute with someone who is now an ex-friend and this passage popped into my head. I searched the web a bit and I think this gives the best explanation of the passage that makes sense — clarifying the situation without trying to just blunt Jesus’s message. Thank you very much for this post, it clarifies the best way for me to proceed. I will contend that I am correct in my position but if he, but if he continues to insist, I will pay him what he claims I owe because in the end, continuing the battle would just harm me more than its worth for all of us. Its a balance of maintaining a clear stance of right and wrong but living with a softness of knowing that my own life and peace is more valuable than dragging out a conflict. Oh and the other thing your explanation highlighted is that even though I am unhappy with how it played out, I will need to just walk away and let it go. An outpouring of bitterness and backtalking will do me no good. I won’t forget this incidident if I ever come across him in future dealings, but hanging on to bitterness or unnecessarily broadcasting the injustice will only continue to cause further harm to my own peace. Thank you for the kind words. Your decision is not an easy one. But you are right, at some point, you just have to get on with life, and while you could drag this out, you need to decide what has more value: the money, or the time and energy you will spend fighting for the money. Justus, If you don’t mind my asking, what caused you to abandon your Christian beliefs? PS it’s great to see you being the bigger person in the situation with your ex friend. Hi, good article . 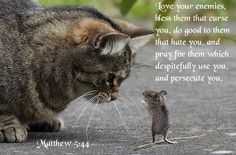 What I want to know is, is that picture above the beginning of the article of the cat and the mouse with the scripture about loving your enemies a poster that I can buy from your site? I just love it. Many of these statements in the New Testament should be taken within the context of what was said to be occuring in the first century. It has been far to long that the church has been so igorant of what the biblical text actually says. The first century was the “last days”. Many think that escatology is just a side issue(well, that is probably not true for many with all of the last days stuff being spouted now). There is clear indication that the return of Christ IN JUDGEMENT was only a little ways off and getting closer as the years went by and later books even say it was “at the doors” and the greek in many instances should have been translated as “about to happen”. So many of these injuctions make more sense in a direct way at that time than they do now. Even Paul, in at least one instance, claimed his rights as a Roman citizen against the abuses of officials. I really think that more thought needs to be put into this but unfortunately most of the church has given up thought as a bad thing, something againts faith. We have gotten what we deserve. The churches have sown irrationality and unbiblical ideas and now our nation is run by the irrational and immoral. You all know the verse: God is not mocked, whatsoever a man sows that shall he also reap. I did send you an e-mail about your comments about homosexuality and part of my comment will reflect those words to you. I found it difficult to continue reading what I find to be a profound explanation of Jesus telling us to love our enemies, because of those comments that avoids calling homosexuality what God distinctly calls it. This is far from harsh judgmentalism as Jesus is clear we are to judge the righteous judgment (John 7:24). I too, believe that Christians can use their rejection of homosexuality as a hypocritical judgement. We have greed, infidelity and even emotional abuse that we seem to give a pass to. But… it’s not wholly clear to me if you are endorsing an acceptance and entering into the lifestyle. In a time where false teaching is plentiful and “professing” Christians are comfortable not knowing what the Book says, it’s utterly so very, very important that you be clear. Paul the apostle learned from no man. He tells us this. So the Lord taught him. Paul writes in 1 Corinthians 6:9-11 very, very clearly that the homosexual will not see heaven. I can remember a few false converts who upheld a gay lifestyle who either looked at me with blank revelation or erupted into an emotional rage accusing me of tearing down their faith. I wasn’t trying to hurt them. Anymore than Jesus was when He spoke of sin. There is more of a testimony in my e-mail that I hope you will read. In the midst of a mostly great article, you haven’t recognised that your LGBT ‘wedding’ comments are a total contradiction of everything else you said. Yet from what you already said you dont tell us to give the crack or heroin users money for drugs, nor help further their sin further by driving them to their drug dealer or collecting it for them, nor giving them a legal licence to buy & use & sell these drugs. Yet this is what you’re suggesting we do re LGBT ‘wedding ceremonies’. To do such things would be to contribute to & participate in these people’s sin & therefore helping them succeed in it. It’d also be contributing to the celebration of those sins, & would be recognised by the whole community that you’re showing your approval of it so much so that you’re going to unusual lengths to do as much as possible to make it even more pleasurable, easy for them to do this with even greater success & celebration. Such actions would not only be giving ‘licence to sin’, but you yourself even actually said that we should go out of our way to give them a literal legal licence to do what God hates so passionately & warns against. To do as you suggested would also be hugely contributing to the delusions that satan has already trapped them in so as to destroy them & society & to make it harder for them to see they’re in sin & need to repent. You are able to clearly see where the scriptures you mentioned can do harm when misconstrued & so you’ve searched the meanings of these out, which is great, & may help some people from unnecessary loss or guilt, but my concern is that the scriptures you’ve searched out are the ones which already the bulk of society would challenge & don’t obey in the misconstrued form. Yet when it comes to the LGBT issue, you’ve been swayed by society’s thinking & been blinded to see how much you’ve contradicted yourself. Neither have you recognised that these particular LGBTcomments of yours have totally contradicted the bible, & I sincerely hope you will humbly recheck through your comments to see where you’ve contradicted yourself & God’s written Word. Please humbly consider your own very good points on these scriptures you’ve discussed & see how they are in contradiction of your LGBT comments.